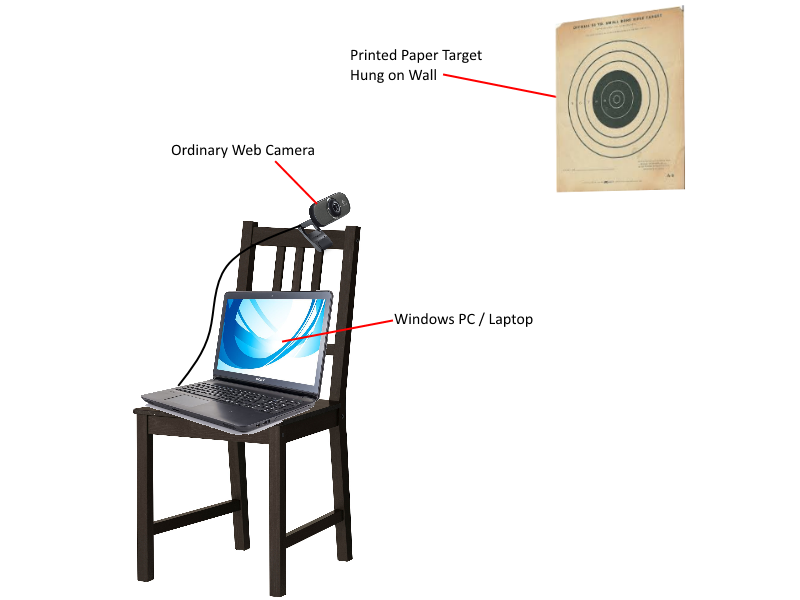 Sharp Spotter is a Windows PC based application that uses an ordinary web camera to detect laser shots made while target practicing. 1) A laser training cartridge is installed in a standard firearm. 2) Targets are hung on a wall to be shot at. These may be any matte finish (non-glossy) paper or cardboard target. • Target Practice- General untimed shooting of targets. Experiment with various target sizes and scores, or just do a little plinking. 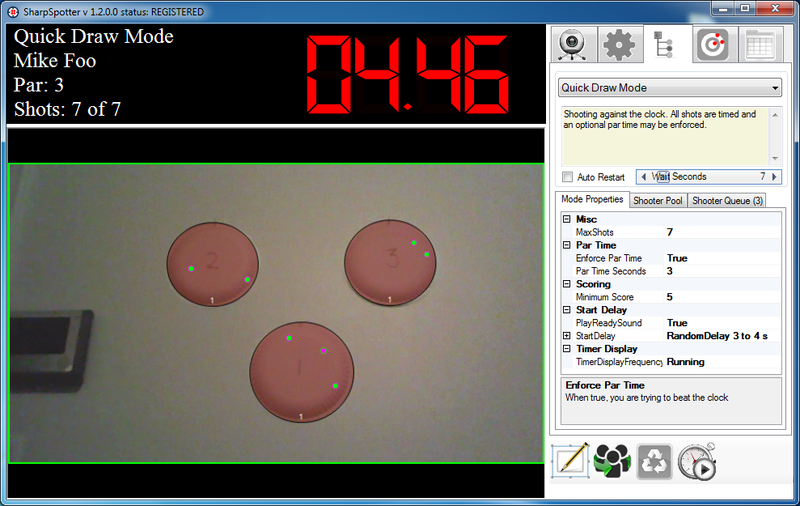 • Accuracy Mode- Shooting with a designated bullseye and calibrated target area. Displays overall group size and distance from bullseye on each shot. Optional announcer voice may audibly report high/low, left/right distances. • Quick Draw Mode- Shooting against the clock. All shots are timed and an optional par time may be enforced. • Shot Commander- Create two or more targets and the shot commander will call your shots. • Shooter VS Shooter- Each queued shooter is assigned to a target. First target/shooter to accumulate the configured score wins. Missed shots are not registered. • Diagnostic Mode- This mode will capture sample images of the shots you take. Use to analyze grip issues, triggering technique, etc. This application was born from necessity, due to the lack of a nearby and convenient live-fire shooting range. The most popular range in town was usually so crowded the wait times for a lane could easily exceed one hour. Couple that with high ammo prices, the range's hours of business, etc... It soon became clear that a new option for target practice was definitely in order. I purchased a .40 cal Laserlyte cartridge on Ebay. It was better than nothing, but after using it for a week or so, I was bored. This drove me to seek out what the market had to offer by ways of electronic targets and other software options. My searching failed to produce an option that fit my needs (low price and high features). There were a few packages out there that I found interesting, but the ones that I saw either offered too few options, or they were so complicated and expensive that they looked like they would be more than I needed. At that point, I decided that if I wanted it done right, I would do it myself. After a few weekends of furious coding, the project began to take on a spirit of its own. After getting a glimpse of what it was becoming, I could not wait to use it- after all, I was still chomping at the bit for some serious range time. As the weeks turned into months, I rewrote the "guts" of the application no less than 3 times. This was because the goals listed above became more clear as I used each prototype. The end result is Sharp Spotter. One of the neatest side-effects of writing this application was that as I tested it every day, I noticed that my speed and accuracy improved remarkably. I figured that if it worked for me, chances are that other folks might benefit as well. Is it a game or a training tool? That is up to you- I like to think of it as a fun way to become a better shooter. Please try it out and see what you think. I was originally going to charge for this software but I am throwing this out there for free, mainly because I do not have the time to fully support it. I will try to put enough help and info out there so that a "reasonably self-sufficient" individual might be able to download the package and get started in a matter of minutes. Please keep in mind that this is a free offering with no guarantees. If Sharp Spotter helps you become a better shooter, please be kind enough to make a small donation to help finance the cost of our web hosting fees.